Type 1 diabetes is much rarer than Type 2 diabetes, but it is a very frightening disease that can be difficult to control unless you are vigilant. With this form of diabetes, the body's immune system actually fights and destroys the cells in the pancreas responsible for creating insulin. The destruction of these beta cells leaves the body without the ability to create sufficient amounts of the hormone, and this means that the body is going to have some severe problems. Insulin is vital to the body's processes. Whenever you eat something, the glucose in the food causes the pancreas to release insulin. The amount of insulin the pancreas releases depends upon the size of the meal you ate. This insulin then guides the glucose to the cells of the body. As glucose enters the cells, the blood sugar level drops. 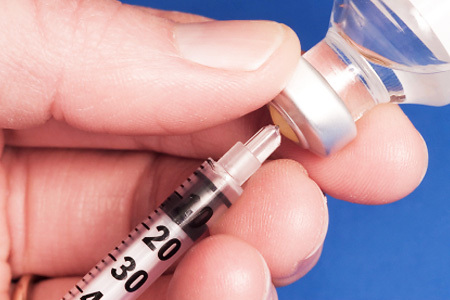 Without the insulin, this process of the body is not going to happen, and you will find that it can cause a wide variety of different problems in the body. Because of the increased sugar in the blood, the body will try to clear that excess sugar. This means that you will have increased urine output, which can result in dehydration. The lost of the sugar can also mean weight loss since you will not have the calories that you need from the food that you eat. Sugars may also build up in the body and cause ketoacidosis. The loss of water and the buildup of sugars and acid in the body can even be life threatening if you do not get treatment in time. You can find quite a few other symptoms that occur with Type 1 diabetes. Damage to the nerves, particularly the kidneys, heart and eyes can all occur. In severe cases, shaking and confusion can occur. Rapid breathing, abdominal pain, a fruity smell on the breath and loss of consciousness can occur as well. It is important to get to a doctor as soon as possible. In most cases, the diabetes will present itself in people who are under the age of 20. This is not always the case though, as the disease can manifest at any age. Type 1 diabetes can be inherited and passed along a family line, but this is not the only way that people develop the disease. In fact, there is still quite a bit of mystery around what factors, whether they are all genetic or they have environmental components, cause this form of diabetes. Many who have the disease have autoantibodies, which are doctors believe to be the cause of the destroyed cells in the pancreas. The doctor will be able to determine if you have Type 1 diabetes with blood tests. He or she will be looking for high blood sugar levels. Other tests are administered to determine the type of diabetes that you have, and to make sure that you receive the correct diagnosis. Those who have Type 1 diabetes can live long lives, but they have to make sure that they keep their blood sugar levels in the correct range. With the right exercise, meal plans and insulin therapy, it is possible to manage.